Continue reading to learn about the potential health benefits that come with sleeping on the floor as well as how to do it properly, and tips for adjusting your sleep posture to relieve lower back pain. While it may not sound comfortable—especially when there are new, body-hugging mattresses being advertised daily—sleeping on the floor can actually provide you with a host of benefits, including the ones listed below. Stretching: Sleeping on the floor will allow your body to stretch out while you sleep and benefit your whole form. In comparison, when you sleep on a mattress, your body does not get the chance to fully stretch and stays in a compressed, hunched position that can cause alignment issues with the musculoskeletal system. Posture: Sleeping on your back on a hard floor can help improve your posture and leaving you standing straighter naturally. Lower back pain: Lower back pain can also be reduced by sleeping on the floor as it prevents any misalignments from occurring that may cause pinched nerves or bone dislocations. 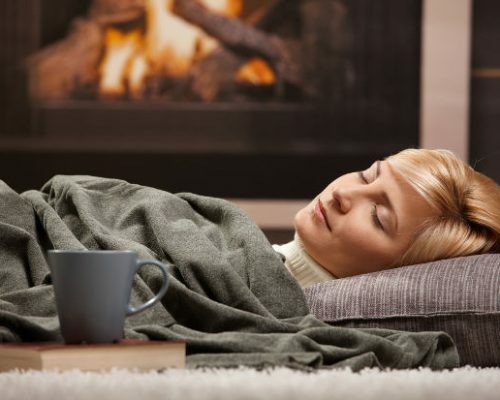 Stress: Research has found that sleeping in a natural position on the floor can reduce stress and better your mood. Alignment: Your hips and shoulder will become aligned in more natural and symmetrical positions when you sleep on the floor, which can reduce aches and pains and improve your posture. If you suffer from lower back pain but aren’t sure you’re ready to try sleeping on the floor, there are other helpful tips to help you relieve your discomfort and get a good night’s rest. If you sleep on your side, try placing a pillow between your knees and a small, rolled-up towel under your waist to better support your spine. If you sleep on your back, put the pillow under your knees, and the rolled-up towel under the curve of your back. If you’d like to try sleeping on the floor to improve your posture or ease your back pain, the following tips may ease the transition from your mattress. Use a mat: A thin mat such as a yoga mat can provide some cushion without taking away from the benefits provided by sleeping on a hard, flat floor. Sleep on your Back: Sleeping on your back will maximize the potential benefits that come with sleeping on the floor. Choose carpet: Whenever possible, sleep on a carpeted floor as hardwood and tile can be too unforgiving and uncomfortable. Use a sleeping bag: You can use a sleeping bag to provide a thin layer between you and the floor as well as a warm cover. Use one pillow: You shouldn’t need more than one pillow to properly support your head and neck while sleeping on a flat surface like the floor. Ensure the floor is clean: No one wants to sleep in dirty sheets, and in the same vein, you shouldn’t sleep on a dirty floor. Ensure you’ve cleaned the floor before you sleep on it to prevent dust and other allergens from disturbing your rest and potentially making you ill.
Sleeping on the floor is a natural way to improve your posture and relieve lower back pain, though it may seem like a strange choice at first. Using a thin mat and pillow can ease the transition from bed to floor, though as always, ensure your doctor has approved this choice as it may cause issues to you individually.